Image caption The Southsea, Portsmouth, to Ryde, Isle of Wight, route is the world's only commercial hovercraft service. A hovercraft operator has been forced to drop plans to bring in a new route between the Isle of Wight and Southsea over marine safety regulations. 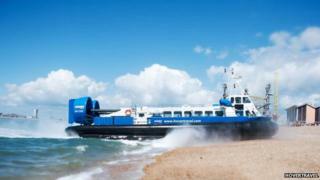 Hovertravel had hoped to introduce the summer service to Sandown on Tuesdays and Thursdays from 14 July to 27 August in a bid to boost tourism. But the 25-minute crossing would not be economically viable, the firm said. The proposed route to runs into the English Channel, which is subject to tougher rules than The Solent. A spokeswoman for The Maritime and Coastguard Agency said: "The proposed route would cross two separate areas covered by two different sets of regulations. "The ferry company would need to bring its hovercraft up to the standards required by both." Nicky Parker, chair of Sandown Business Association, said the decision was "disappointing". She said: "With much of the foundation work already laid I hope we can re-visit the project in 2016/17, when Hovertravel's new craft will be in service." The current Southsea to Ryde route is the world's only commercial hovercraft service.